I’m spending this weekend slaving over a hot stove… and I couldn’t be happier. I’m making like a squirrel (albeit a squirrel armed with a fruit peeler, corer, Agee jars and an old Perfit Seal Home Preserver) and packing the pantry with preserves. 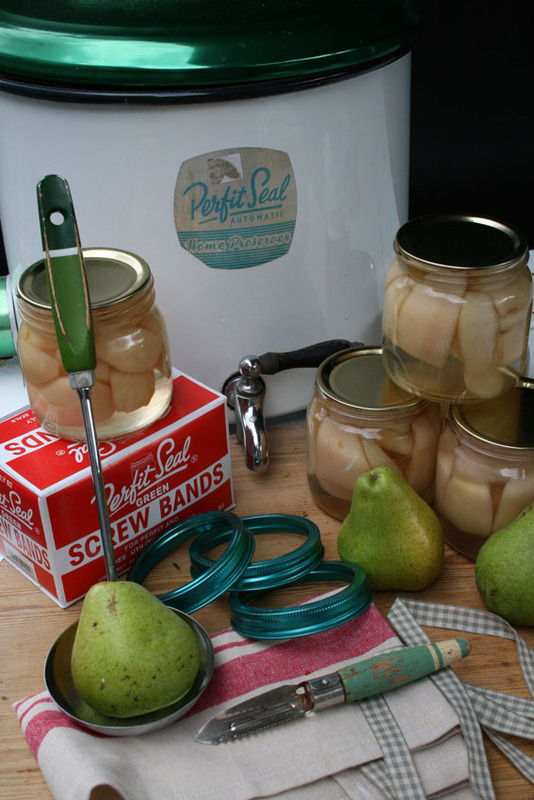 Last weekend we dealt to most of the pears; this weekend I’ve got quinces, apples and feijoas to pickle, brew and bottle. Jason came home today with an aromatic quince from one of the neighbours’ trees. “What’s this?” he said. (The neighbour didn’t know either.) “A quince,” I said. But little did he know that, in one of those funny coincidences, I had a whole box of them in the back of my car too. I got them from my colleague Rachel, whose parents have amazing quince trees in their beautiful garden in Waimamaku in Northland. I promised Rachel that I’d give her a bottle of preserved quinces in return for the raw fruit, though since then I’ve found a recipe on the net for quince vodka. I suspect she’d rather like that too! I’m also going to make quince paste, which is really just fancy boiled-down quince jam. This evening, just before it got dark, I put on my raincoat (it has rained here all day) and whipped out to the orchard to pick the last bucket of ‘Winter Banana’ and ‘Liberty’ apples, plus a good handful of ‘Jelly King’ crabapples. I’ll use some of the crabapples to add a bit of extra bite to my next batch of Walter the Saint’s Speedy cider (this recipe is fairly legendary in NZ Gardener circles, as the first time I made it it exploded in my lounge like a sugar bomb). I’m going to use that speedy cider recipe to put down a few bottles of pear cider and some feijoa wine. And I’m keen to try this recipe from Kumeu gardener Linda Isbister, who shared it with NZ Gardener a couple of years back. You need: 5kg of feijoas (scoop out the flesh, freeze, thaw then squash it), 6 litres of boiling water and 2 camden tablets (from home brewing stores). Place in a big bucket with a lid and stir twice a day for three days. Then strain into another bucket (cover it with cheesecloth to keep the bugs out) or a large fermenting bin (fitted with an airlock if possible) and add one sachet of wine yeast and 2 teaspoons of yeast nutrients (both from home brewing stores), plus 4kg of sugar and another 2 litres of water. Leave until it stops bubbling… which could be a month, or several. Then bottle. Yum! Hi Lynda, If you still have quinces to use up after making vodka and paste can I suggest quince jelly. I’ve been making it for the last couple of days and the flavour and colour is devine and so easy to do! Good idea – I made quince jelly a couple of years ago and you’re right – the colour is exquisite. Like pink stained glass. A few years ago, my ex-boyfriend’s mum also made quince butter (which may just have been stewed quinces whipped into butter, I can’t remember) but that was delicious too. Well done on all your work. No time for the newly married to relax?? Could you tell me please – I am freezing Feijoas, but thought I had to bring them to a simmer first. If I want to use them for desert in the winter, can I freeze them uncooked? Would make life easier, ’cause at the moment I have one arm in plaster. Hi Sue, it depends on how you want to eat them. If you’re going to use them in fruit sponges or pies, I’d simmer them gently first and then strain out the liquid. But if you’re going to just thaw out the flesh to add to cakes and loaves, then just scoop out the flesh, add a squeeze of lemon juice and pop them in one of those plastic zip-lock bags (squeeze out as much air as possible). Easy and takes up no space in the freezer!